A few prayers to your deity of choice would serve you well when dealing with this aspect. Your questions or requests stand a better chance of being answered in the next few days if you do so. This elaborately ornamental charm, worn by Egyptian women, was supposed to bestow upon them all the blessings of their powerful Hathor, goddess of the sunrise, whose worship was universal in Egypt. Health, strength, happiness – all these were the gifts of this their goddess of love. She was regarded as a loving, protecting mother, both of the living and of the dead; was the deity who filled both heaven and earth with her beneficence, and the dispenser of all the blessings of life. 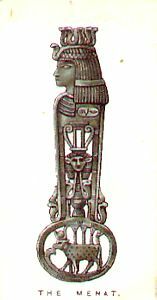 Posted on March 2, 2014 by ladyoftheabyssPosted in Articles, Daily PostsTagged Arts, Deity, Earth, Egypt, Egyptian, Egyptian mythology, Hathor, Literature. Aphrodite: Greek; Goddess of passionate, sexual love. Aphrodite will assist you in pulling loving energy toward yourself. Aradia: Italian; Queen of the Witches, daughter of Diana. Aradia is an extremely powerful entity and a protectress of Witches in general. Whether you wish to bear children or have a magnificent garden, Astarte will assist in your desire. Demeter: Greek; Earth Mother archetype. Excellent Goddess where birthing or small children are involved. Diana: Roman; Moon Goddess and Goddess of the Hunt. Diana is many faceted. She is seductress (as she enchanted her brother Lucifer to beget Aradia in the form of a cat) as well as a mother figure for Witches. Selene: Greek; Goddess of the Moon and Solutions. Appeal to Selene to bring a logical answer to any problem. Adonis: Greek; consort of Aphrodite. Also another name for “lord”. Luce: Italian; Soul mate and Brother of Diana. Father of Arcadia. God of the Sun and Light. Osiris: wiccan; counterpart of Isis. Over-all God form including vegetation and after-life. Pan: Greek; God of Nature and the Woods, Laughter and Passion. Also music and personal abandon. Of course, you can refer to either the God and/or Goddess as merely Lord and Lady if it makes you feel more comfortable. Posted on March 2, 2014 by ladyoftheabyssPosted in Articles, Daily Posts, Deities, The Goddesses, The GodsTagged Aphrodite, Aradia, Arts, Diana, Goddess, Goddess of the Hunt, Greek, Horned God, Moon Goddess, Mother goddess, Passion, Triple Goddess. 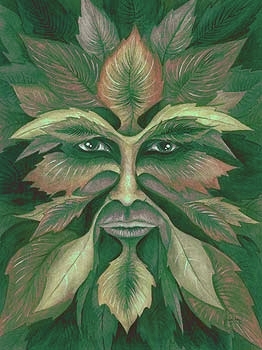 Green Man peers out of the foliage to remind you that not all of life’s mysteries have logical solutions. Be open to magical opportunities, spirit allies, and unconventional paths. Get out into the wilderness, ground yourself in meditation, and listen for Green Man’s wisdom. You may just catch sight of him eyeing you in his leafy camouflage. Posted on February 19, 2014 by ladyoftheabyssPosted in Articles, Daily PostsTagged animal spirit, Arts, Facebook, Green Man, Greenman, Health, History, logical solutions, Sculpture, United States, Visual Arts. We need to get our priorities in a row. A lazy person never has priorities and never plans anything. He lets circumstances make all his decisions – and believes fate has the final say. Even though he has had a thousand nudges to do a certain thing, he ignores them because it is only himself dreaming again. If we cannot hold onto a plan long enough to do anything about it, then we should write it. Write it so plain that when we read it, we run – we run toward putting into practice what we set out on paper. It is essential to decide the ultimate outcome of our lives. If we do nothing, then that is a decision. Our lot in life is what we make it, using every delay, every pain, every injustice as fuel to fire our determination. Posted on February 18, 2014 by ladyoftheabyssPosted in Articles, Daily PostsTagged Arts, Business, circumstances, Daily Feast, Health, Humor in Uniform, JOHN ROSS, lazy person, Lisa Sheridan, Shopping, Sports. Love indicates that love is either present in our life or a distinct possibility. Be open to all possibilities, remembering that true love is given freely, without condition, and does not have to be earned. This is the kind of love we want to welcome into our life and to give to others. Be open to new ideas, and beware of judging against someone in an unloving manner. When Love appears, return to the place where you can love yourself and then seek out the same love from others. As a daily card, Love suggests that for those who are currently in a relationship the opportunity to deepen the bond is present. For those who are single, Love implies that the prospect for them to begin a romantic relationship is very strong at this time. Posted on February 18, 2014 by ladyoftheabyssPosted in Articles, Daily PostsTagged ancient symbol, Aphrodite, Arts, Cupid, distinct possibility, Online Writing, Poetry, Relationships, Romance, Valentine's Day. those who lie and break. Posted on February 16, 2014 by ladyoftheabyssPosted in Dark Arts' SpellsTagged Arts, CRONUS, God, Greek mythology, Hades, Jupiter, RHEA, Zeus.